Bloggers and podcasters, restart your engines! 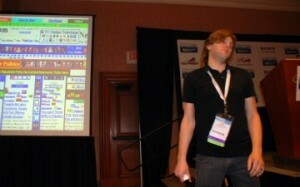 Keep moving ahead or get left behind was the message Todd Cochrane, CEO of RawVoice, shared with about 70 blogging and podcasting enthusiasts Oct. 16 at BlogWorld and New Media Expo. Survival of the fittest, he said, dictates that content creators continue to evolve their media using the The Triple Play: Streaming, Podcasting and Blogging as a Way to Accelerate Your Show’s Growth and Distribution. In the natural course of things, a content creator might start out simply with a blog . . . and that’s great, Cochrane explained. But the audience growth and monetary potential extends far beyond. Next up? Podcasting. And then? Well, he noted, many podcasters hit a mid-life crisis — sluggish audience growth, if any at all, and audience numbers even dropping off. The cure? Let us see . . . The past 12 months have seen an evolution in media distribution and growth. By providing video or by streaming shows on television set top boxes such as Roku, Vudu (soon to be found on every television sold by Wal-Mart), Boxee and the soon-to-be-released Google TV, audience numbers have already rocketed. Um, don't do this! Keep your sites simple. Start with blogging, evolve into podcasting, then segue into streaming, he said. Mandato walks participants through the quick and easy steps. That transition doesn’t need to be rough. In fact, in the next BlogWorld and New Media Expo session, RawVoice CIO Angelo Mandato and Creative Director Brian Yuhnke walked bloggers through the process using the PowerPress plugin for WordPress. About 40 people took part, took notes and took home a simple yet spectacular suggestion for moving ahead their media. In Blogging and Podcasting Sitting in a Tree … Optimizing a WordPress Site for Your Podcast, Mandato and Yuhnke demonstrated the PowerPress plugin for WordPress, a simple means to get audio and video media on your site. The plugin is simple to install, simple to access and makes it simple for your audience to get your cutting-edge shows. And it should be kept simple, they said, noting noisy and overly-busy sites will be a turn off for viewers . . . literally. 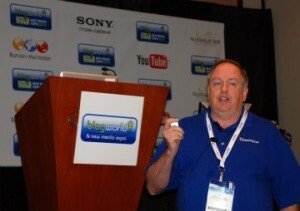 To find out more about or view the sessions, go to the BlogWorld website; they’ll be up soon. 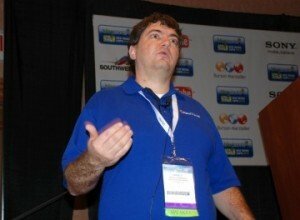 To find out more about the PowerPress plugin, go to Blubrry.com.